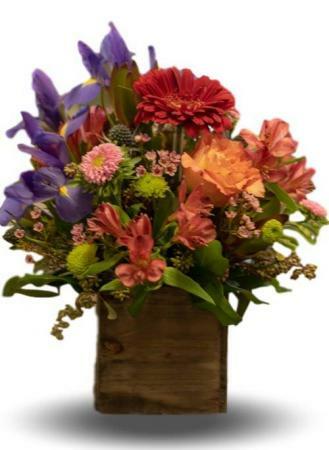 "Country Love" is designed in a 5" wooden box and filled with Gerbera Daisies,Button Daisies, Iris, Asters, Alstroemeria, Thistle and Roses. 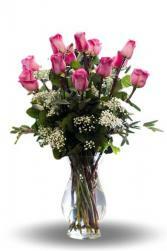 Traditionally Lavender Roses mean "Love at First sight" or just an enchanting way to tell her that you love her. 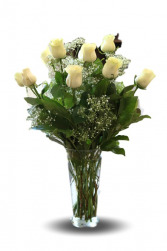 As shown is 1 Dozen Roses, Medium 18 roses and Large is 24 Roses. Vase and shade of Rose may vary. 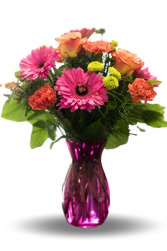 Vase is 10" Tall.